(CBS) Philadelphia - U.S. Customs and Border Protections is trumpeting the recovery of 58 thumb-sized pellets of heroin, with an approximate street value of $45,000, from the stomach of an alleged smuggler. Santos Daniel Rivera, 21, of Philadelphia, now faces federal narcotics smuggling charges, according to a news release on the CBP website. Rivera, who arrived from Punta Cana, Dominican Republic on August 18, was brought to a local hospital and x-rayed after a Philadelphia CBP officer reportedly detected inconsistencies in the 21-year-old's story. 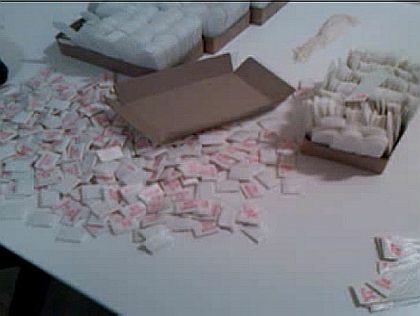 The x-ray detected the presence of foreign bodies and Rivera eventual passed 58 pellets, which were determined to be heroin, according to the press release. "This heroin arrest proves that law enforcement is mostly about listening and observing," said Allan Martocci, CBP Port Director for the Area Port of Philadelphia. "CBP remains committed to stopping narcotics couriers from smuggling their deadly poison through Philadelphia." CBP officers turned Rivera over to Immigration and Customs Enforcement-Homeland Security Investigations agents, according to the release. Internal concealment of drugs, while difficult to detect, is a potentially dangerous form of smuggling. It has caused painful deaths after pellets have breached while inside the carriers.